Using arrays of cold cesium atoms around a nanofiber, researchers at Kastler Brossel Laboratory have reported the first wired entangled state of atoms and the capability to read this quantum superposition as a guided single photon. Credit: Kastler Brossel Laboratory. 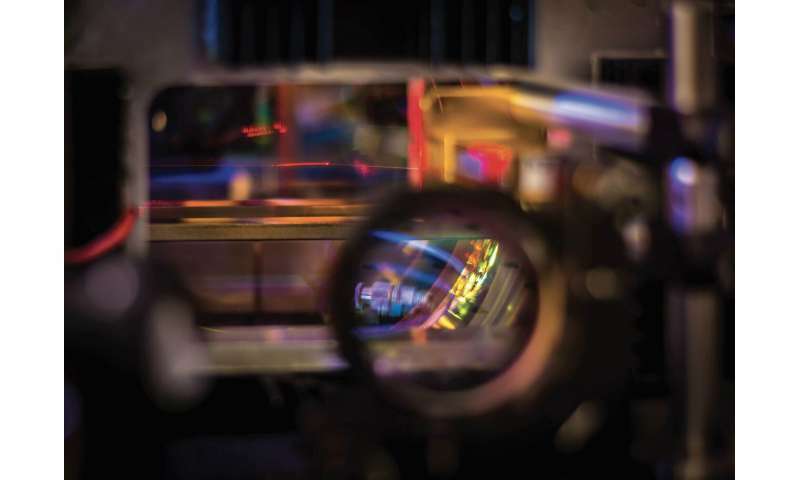 Physicists at the Kastler Brossel Laboratory in Paris have reached a milestone in the combination of cold atoms and nanophotonics. 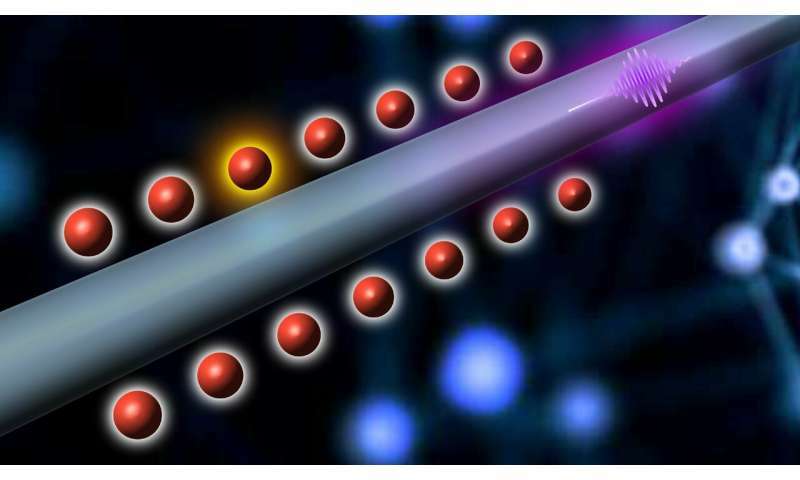 Using fiber-addressable atoms, they have created the first wired atomic entangled state that can be stored and later read out as a guided single photon. The integration of cold atoms with nanoscopic waveguides has raised a lot of interest in recent years, giving birth to a booming research field known as waveguide quantum electrodynamics. Such integrated platforms hold the promises of better scalability and figures of merit than free-space implementations, which will eventually lead to on-chip technologies for a future quantum internet. This combination could be a new frontier for atom-photon physics. So far, the experimental progress has been limited due to the very challenging combination of these two worlds. In the journal Nature, Professor Julien Laurat and his colleagues at Sorbonne University report that they have used an atomic register composed of a chain of individual cesium atoms tightly trapped along a nanoscale waveguide. In this configuration, they were able to generate and store a single atomic excitation, as in a quantum memory, and subsequently read it out in the form of a guided single photon. In the experiment, the nanowaveguide is fabricated from a commercial fiber of which the diameter has been locally reduced to 400 nanometers. Given the fiber's diameter, a large fraction of the light travels outside the nanofiber in an evanescent field, which is heavily focused along 1 centimeter. This field allows 2000 cold atoms to be trapped around 200 nm from the nanofiber surface. "This is a very powerful technique to trap cold atoms and to interact with them via a fiber," says Jérémy Raskop, a graduate student involved in this experiment. "This trapping technique was developed a few years ago, but pushing the system to make a quantum device was a strong challenge." Picture of an optical nanofiber (in red) inside a vacuum chamber. Arrays of individual cold atoms can be trapped around the fiber -about 200 nanometers from the surface- and addressed via the guided light. These “fibered atoms” offer an integrated platform for quantum information networks and for waveguide-QED investigations. Credit: Kastler Brossel Laboratory– N.V. Corzo. Initially, all the trapped atoms in the register are prepared on one energy level. Then, a weak write pulse that illuminates the fiber induces scattering. The detection of a single photon inside the fiber heralds the creation of a single collective excitation shared among the whole atomic chain. To retrieve the stored information, an external read pulse is sent to the atomic ensemble. The atom-waveguide coupling then allows the efficient transfer of the single excitation into a fibered single photon. The performance is already above the known operational benchmarks for the realization of quantum network primitives. "This work is an important milestone for the emerging waveguide-QED field as this capability brings it into the quantum regime," says Neil Corzo, a Marie Curie postdoctoral fellow and the lead author of the study. "Our device can find applications for quantum networks as our experiment now offers a wired quantum node. Also, our demonstration opens an avenue for new studies towards quantum nonlinear optics and quantum many-body physics in this one-dimensional system." This demonstration follows other works that Laurat's group has done in recent years, including the first demonstration of stopped light in an optical fiber or the realization of record-breaking efficient quantum memory for secure storage.